Cinnamon came in for an appointment when her owner noticed that she was looking bloated and had a decrease in bowel movements. Her owner also noticed some bloody discharge on her hind end a few days prior, which subsequently stopped. 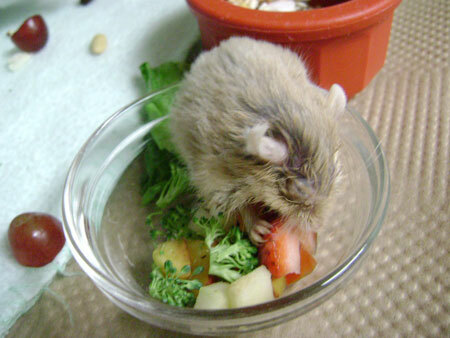 Cinnamon was still eating some of her hamster food but her appetite had been decreasing. On physical exam, the doctor found that she was quite thin despite a very distended belly, which contained what felt like a fluid filled mass. Her weight was 55 grams, however it was likely that a large amount of that weight was due to the growth in her abdomen. She also had a broken top incisor resulting in her teeth not occluding normally. Hamsters have continuously growing incisor teeth and this can be a common finding, however if left untreated it can make eating difficult. Her broken tooth could have been from an injury such as from biting on cage bars or hard objects and during her exam the doctor trimmed the other teeth in order to make them even. We suspected that the broken tooth was secondary to the abnormal growth in her abdomen, which was the main reason she was not feeling well. Two common causes of abdominal masses in hamsters are either large abscesses (infections) or growths/tumors. Cinnamon’s owner was informed that Cinnamon needed surgery to explore the abdominal growth and the owner agreed. The next day, Cinnamon was dropped off for surgery. Cinnamon was treated with antibiotics, pain medication, and fluids prior to anesthesia. The doctor decided to use a very safe anesthetic gas called Isoflurane to keep her unconscious and free of pain during surgery. Our anesthetist recorded Cinnamon’s vital signs and monitored that she was doing well by using anesthetic equipment that measures oxygen levels, heart rate, and respiration rates. Because little pets get cold very quickly during anesthesia, Cinnamon was kept warm using a forced hot-air-blanket. The surgeon very carefully made an incision on her abdomen and it was revealed that Cinnamon had 2 large growths in her uterus. We proceeded to surgically excise the diseased uterus and ovaries which is a procedure called a “spay” or ovariohysterectomy. Due to her small body size, it was indeed very challenging to separate the tissues and place sutures around the tiny blood vessels in her reproductive tract. Regardless of our challenges, the surgery went very well and there was hardly any loss of blood. After the surgery was complete, we gave her 100% oxygen until she was fully awake. Her body temperature was slightly cold so we continued to provide heat support until it was normal. Her weight after the spay was 31 grams, which meant that the growths were 24 grams; equivalent to 40% of her entire weight! Cinnamon made a quick recovery and we were very happy to see her moving around after 5 minutes. She had been given a strong pain medication before the surgery and did not seem too uncomfortable. The doctor also gave her an injection of an anti-inflammatory after she woke up to help her recover even faster. 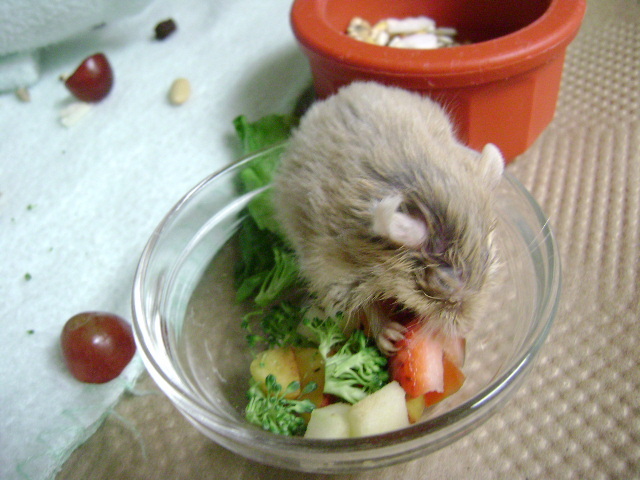 Amazingly, Cinnamon started munching on a piece of blueberry 1 hour after she was finished with surgery! She stayed in the hospital for one night and was discharged the next day since she was doing so well. Female rodents such as hamsters, rats, mice, and guinea pigs have a tendency to develop growths in their reproductive tracts. Some species such as rats and mice also have a tendency to develop mammary tumors. These diseases are due to feedback of estrogen from their ovaries. As prevention, we recommend that all rodents be spayed at a young age to remove the source of the estrogen. The risk of a spay on a young healthy pet is low when performed by an exotic pet veterinarian. Anesthesia on exotic pets is a very routine procedure at our hospital. Cinnamon is a very fortunate hamster to have such a dedicated owner and she is now happily enjoying her new-found health. She has been steadily gaining weight and has been eating like a champ! We hope that she will continue to do well and look forward to seeing her at her wellness check-up in 3 months!